Breakfast as easy as 1-2-3! Layer vanilla yogurt, granola and fresh fruit for a quick and delicious breakfast parfait. 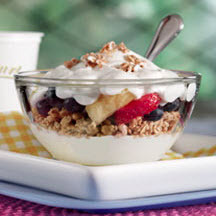 To assemble parfait, begin with 1/2 cup yogurt in the bottom of a bowl or tall glass. Add 2 tablespoons cereal and 1/4 cup fruit. Repeat. Top with the remaining 2 tablespoons of cereal. Nutritional Information Per Serving (1 recipe): Calories: 460; Fat: 6 g; Saturated Fat: 2.5 g; Cholesterol: 10 mg; Sodium: 300 mg; Calcium: 40% Daily Value; Protein: 17 g; Carbohydrates: 88 g.
Recipe and photograph provided courtesy of the National Dairy Council.